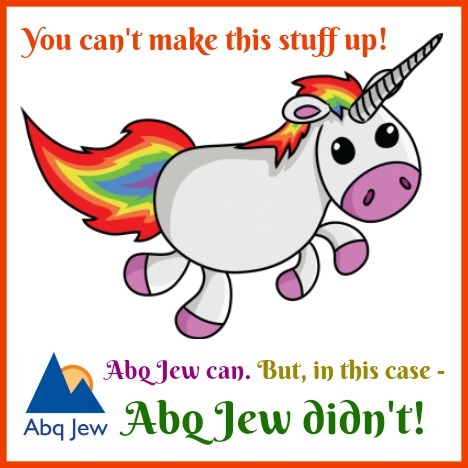 Abq Jew ® Blog: Trade Up Your Abq Ride! Trade Up Your Abq Ride! 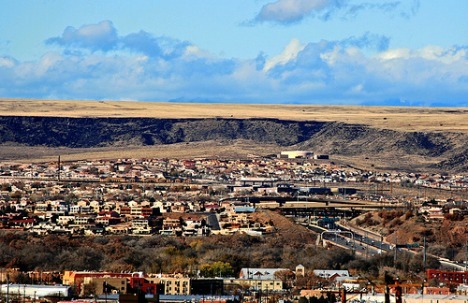 Home of Great Deals: Try as he might (and he did, mightily), Abq Jew just could not resist writing about his new home, the City of Albuquerque, and its informal but highly successful auto exchange program. But let's start with something completely different - Lavu. The company Lavu is one of Albuquerque's greatest start-up success stories. 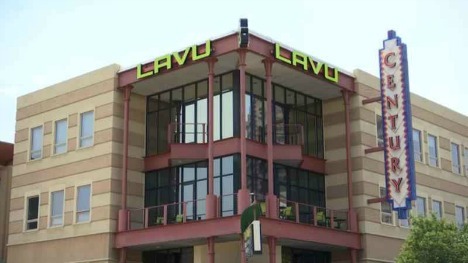 Lavu is particularly proud of their New Mexico, Albuquerque, Downtown location. Being in Albuquerque gives us a Wild West spirit. We like to think we bring that to what we do: Like our predecessors here, we break the mold. We are pioneers and innovators. We were the very first restaurant point-of-sale system for the iPad in the App Store, and since then, we have grown tremendously to become the largest mobile point-of-sale system for restaurants in the world. Oh - and Lavu is hiring! Which made this story especially upsetting. 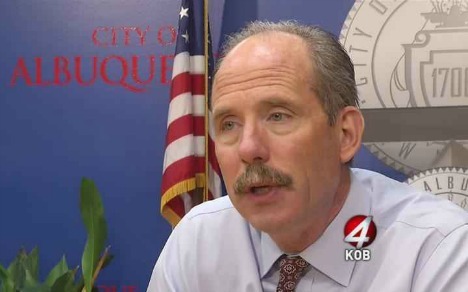 ALBUQUERQUE, N.M. – Violent crime and drug use continues to be a big problem across Albuquerque. So much so, in fact, that one high-tech company that calls downtown home is saying enough is enough. 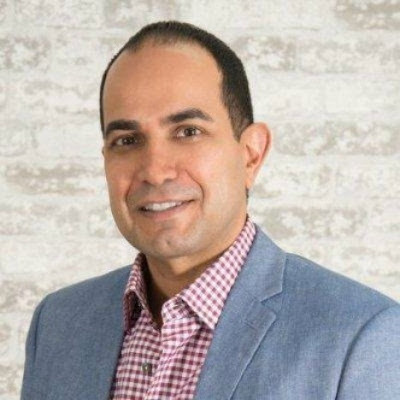 Ohad Jehassi, the president of Lavu – which provides point of sale software systems for restaurants – said it’s getting so bad the company is thinking about moving out of the area, or even the state. 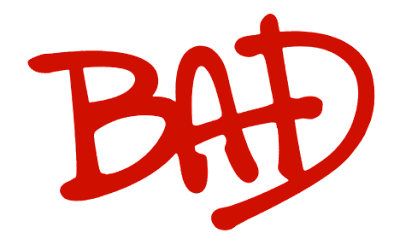 Jehassi sent a letter to Mayor Richard Berry and Governor Susan Martinez stating that a Lavu employee recently filed an official complaint alleging the working conditions in the area where Lavu is located are unsafe and present an imminent danger for employees. “I cannot stress enough to both of you how serious the lack of safety in downtown Albuquerque has become for Lavu,” the letter states. Overall safety - particularly in downtown areas, and particularly at night - is a BIG problem. And the Albuquerque Police Department - again, operating under a DOJ Consent Decree - is struggling to deal with it. But let's get back to our subset of the problem under discussion - auto thefts. ALBUQUERQUE, N.M. -- Albuquerque has a big crime problem, especially when it comes to stolen vehicles. 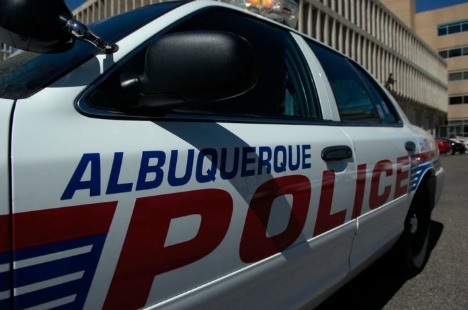 KOB crunched statistics from the Albuquerque Police Department and found a steady increase in the number of auto thefts reported each year. Looking back at the first four months of 2015, auto thefts jumped 35 percent from the previous year. It was another 13 percent over the same time period in 2016. Thefts are up another 28 percent so far this year. And according to a recent national report, Albuquerque ranks first nationally for the highest auto theft rates. The report released by the National Insurance Crime Bureau shows in 2016, Albuquerque, including Bernalillo County, led the nation with more than 10,000 auto thefts reported. On average, 27 automobiles are stolen every day between Albuquerque and Bernalillo County. 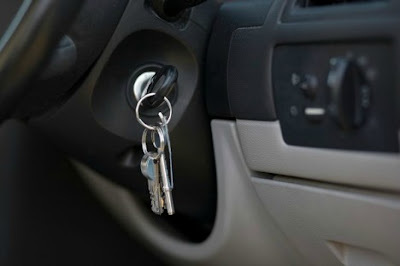 How bad is the auto theft problem? 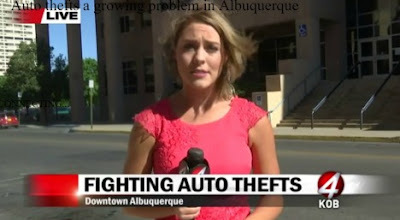 ALBUQUERQUE, N.M. — Someone stole a television news station’s SUV in Downtown Albuquerque while the crew was gathering footage for a story about crime in the area. Michelle Donaldson, KOB news director, said the crew watched as the vehicle was stolen near First and Central. The crew was in the area reporting on recent concerns about crime and safety by the local business Lavu when they became part of the story. KOB recovered the vehicle within a half hour without police assistance by following the GPS tracking device that was on board, she said. “We went to that location and recovered our own stolen vehicle,” Donaldson said. She said the thief was no longer with the SUV and it had already been damaged. The SUV was locked and the keys were not left inside. Donaldson said she is not sure how the thief started the SUV. 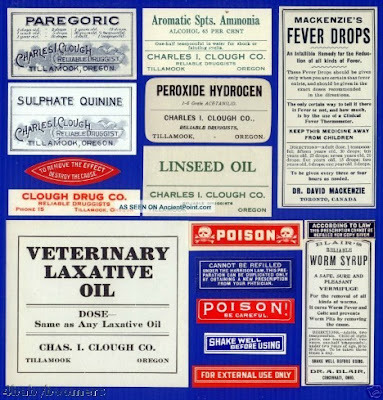 So let's talk about remedies. You know - simple steps that could alleviate the situation or perhaps even eliminate it. That way, a potential thief would think it's a bait car and steer clear of it. But that strategy doesn't work in Albuquerque! 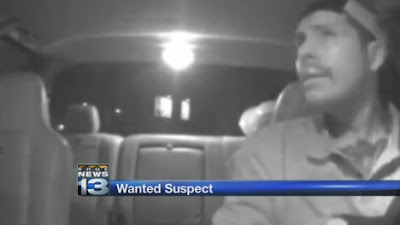 ALBUQUERQUE, N.M. (KRQE) – An alleged bait car thief has been arrested, but he didn’t go easily. Raul Garcia, 30, was seen on surveillance video taking the city owned bait car last month. Police say he ditched the car and got away. Earlier this month, police spotted him again, but he took off. Then on Tuesday, police found him in a stolen truck at the Puerto Del Sol Golf Course where once again he tried to get away, driving on flat tires and on the wrong side of the road. Which brings Abq Jew - and you, his loyal readers, if and only if you're willing - to the Belt Parkway, New York's Greatest Scenic Ride. California has the Pacific Coast Highway; the Southwest, its historic Route 66. New York? Our great drive may be the Belt Parkway, whose 25 miles hug green space and coastline along south Brooklyn and eastern Queens. Yes, the Belt can be a traffic nightmare for those heading to Kennedy International Airport or over the Verrazano-Narrows Bridge at rush hour. But there are times — say, 11 a.m. to 3 p.m. on weekdays and early Sunday mornings — when the grandeur of the Belt reveals itself. 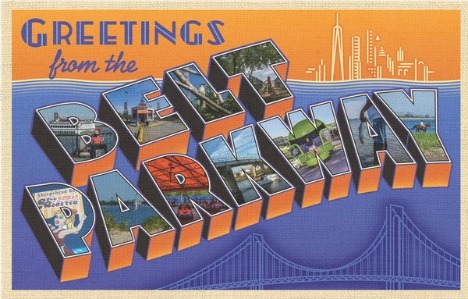 If you take the Belt Parkway eastward from Brooklyn (and where else would you be starting from?) 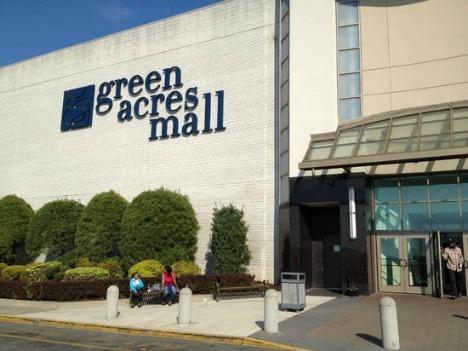 and exit at Sunrise Highway, you will eventually, ultimately, arrive at the world-famous Green Acres Mall in Valley Stream. Folks who wanted to trade up their vehicles parked them at Green Acres, went home, waited a day or two, then reported them stolen. And they would be. Could 'trading up' be Abq's future? Abq Jew most sincerely hopes that Albuquerque, his new home, rises (it's already 5,312 feet above seal level downtown) to its full potential. Don't leave Abq! Come to the Westside! Despite the light touch with which Abq Jew has approached the topic, crime in Albuquerque is a serious problem. We may laugh at statistics, but when things happen to us or to our family or to our neighbors - it's serious. Fortunately, there are organizations and - most importantly - people who never take public safety for granted. And local news outlets like KOB who report about it. ALBUQUERQUE, N.M. -- Concerns about crime in Albuquerque have some residents wondering if Mayor Richard Berry deserves a public safety award from the Greater Albuquerque Chamber of Commerce. “Because there isn't any safety here at all," Clara Montana said. But others, like Patti Hoech, who owns Patrician Design downtown, support the mayor. 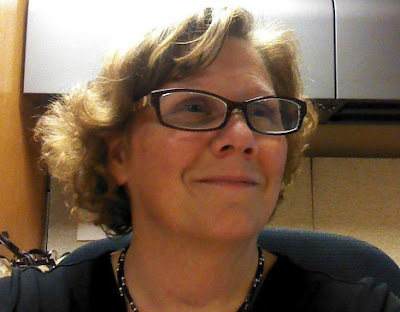 "I think the mayor has done a wonderful job on many fronts,” she said. “I think this is a huge problem and it's greater than his office ..."
The Wedding Plan in New Mexico!